I had originally supposed that Galileo based this conjecture, one of the most important in the whole of physics, on actual observations but, if so, Galileo kept very quiet about it. For the man who is hailed as the ‘first empiricist’, Galileo seems to have been singularly uninterested in checking out this remarkable relation which would have delighted the Pythagoreans, believing as they did that all physical phenomena were reducible to simple ratios between whole numbers. Admittedly, Galileo was blind when the Dialogue Concerning Two World Systems was published but he surely had ample time to investigate the matter during his long life ― perhaps he was reluctant to test his beautiful theory because he was afraid it was not entirely correct (Note 1). Or, more likely, he wanted to give the impression that he had deduced the ‘Law of Falling Bodies’ entirely from first principles without recourse to experiment. We must remember that a Christianised Platonism provided the philosophical framework for the thinking of all the early classical scientists right up to and including Newton. Galileo himself wrote that “As to the truth of which mathematical demonstrations give us the knowledge, it is the same which the Divine Wisdom knoweth” (Galileo, Dialogue). He does claim (via his spokesman Salviati in the Dialogue) that there exists a proof and “one most purely mathematical” (to be given in outline in a moment) but one wonders how on earth he got hold of the relation in the first place since it does not seem to be based on general physical principles as Newton’s formula for gravitation was. As with so many other important discoveries, Galileo most likely just hit on this striking relation by a combination of observation and inspired guesswork. Note that Galileo still speaks the language of continued ratio just as Euclid did (and Newton continued to do in the Principia) : the ‘Law of Falling Bodies’ does not constitute an equation of motion in the modern sense (Note 2). There are various reasons for this apart from Galileo’s respect for the ancient Greek geometers. For there is safety in ratios : they do not tie you down to actual quantities while implicitly assuming that these quantities really exist beyond what one can ever hope to examine in practice. Above all, the language of proportion or continued ratio sidesteps the question of whether space and time are ‘infinitely divisible’ since the rapport holds either way. Galileo’s continued ratio concerns distances and not speeds. The statement that the successive distances are in the ratio of the odd numbers would still be true if, during a given interval of time, the particle moved at a steadily accelerating pace, if it stayed motionless for most of the time only to suddenly surge forward at the close, or again move around erratically (Note 3). Provided the recorded distances in successive intervals of time are in the ratio 1:3:5 (or 7:9:11), the rule holds. Moreover, supposing the rule is correct, we only need to determine a value for a single interval (and not necessarily the first one) to work out all the others. The difficulty with problems concerning speed is that speed, unlike distance, is not something we can actually observe (Note 4). We have perforce to start with distances, at least one, that we can determine by observation and check it against repeating signals like the ticking of a clock or the beating of a pulse (Galileo used the latter to time the swinging of a censer when at mass). However, once we have at least one clearcut distance/time ratio, in order to work out further distances ― which is basically what we are interested in ― we have to deal with speeds (rates of change of distance with respect to time) and then backtrack again to distances. That is, we have to move from the observable (distances, intervals of time) to the unknown and unobservable (speeds, accelerations) and finally back to the observable. The very idea of a ‘formula of motion’, i.e. a statement which, in algebraic shorthand, gives all distances at all times, is a thoroughly modern invention that required a gigantic leap of thought : not only did the Greeks did not have a clear conception of such a thing but Galileo himself seems to have hesitated on the threshold of the Promised Land without really entering it. Suppose we start off with Galileo’s rule d1 : d2 : d3 …… = 1: 3: 5…..: and generalize. We have observed, or think we have observed, that a body starting from rest falls, say, 1 metre in the first second. So it will fall 3 metres during the second interval, 5 during the third and by the end of the third second will have fallen altogether 1 + 3 + 5 = 9 metres = 32 metres. Since the odd numbers 1 + 3 + …. (2n–1) n = 1, 2, 3… add up conveniently to n2 we have a formula already. And, since there is nothing sacrosanct about a second as an interval of time, we might try going backwards and consider halves, thirds and fourths of seconds and so on. So, when dealing in half-seconds, since the particle falls 1 metre per second, it must fall ½ metre in the first half-second, 3/2 metres in the second half second, i.e. 2 metres already (even though it has only fallen 1 metre in the first second). And if we deal in thirds of seconds, the particle falls (1/3 + 3/3 + 5/3) = 9/3 = 3 metres, and if we deal in fourths of seconds it has fallen (1/4 + 3/4 + 5/4 + 7/4) = 16/4 = 4 metres so it looks as if the particle’s speed increases the briefer the intervals of time we consider! What has gone wrong? The answer is that Galileo’s ratio does not tell us anything about speeds as such, only distances, and we cannot just project back the observed ‘speed’ evaluated over a given interval because this speed has maybe been changing during the interval considered. As a matter of common observation a falling body falls faster and faster as time goes on, so it does not have a fixed speed over a given interval. When Galileo spoke of the distances fallen, he was referring to the distance the body had fallen by or at the end of the interval. And like practically everyone else then and since, Galileo assumed that, in such a case, the speed changed ‘continually’ (or continuously) rising from an initial speed, which the particle has at the very beginning of the interval, to a final speed which the particle attains only at the very close of the interval. So how do you work out the speed, and thus the distance traversed, during any interval of time? To get out a formula, it is seemingly no good just knowing the distances, and thus the speeds, of falling bodies over macroscopic intervals of time like seconds: we need to know the distances they fall in intervals of time too small for us to measure directly. Moreover, any error we make in an observed value over a relatively large interval like a second will most likely get magnified when we extrapolate forward to immense stretches of time, or backward to ‘microscopic’ time. The ‘Law of Falling Bodies’ (that, during equal intervals of time, the distances fallen are as the odd numbers) takes for granted the following : (1) that, during free fall, a particle’s motion is always increasing ; and (2) that the speed increases steadily ― does not, for example, increase and then decrease a little or halt for a moment. We can take (1) as being based on observation. (2) is also based on observation in the sense that we do not notice any fluctuations (though there might well be some too small for us to pick up) and Salviato, Galileo’s spokesman in the Dialogue, after discussing the point, concludes that it is “more reasonable” to conclude that the increase is regular. But this is not all. Not only does Galileo (and practically all physicists since his day) assume that there is a ‘steady’ increase (in the sense that the particle does not backtrack or even stay motionless for a moment) but that the accelerating particle takes on all possible intermediate speeds. “The acceleration is made continuously from moment to moment, and not discretely (intercisamente) from one time to another “ (Galileo, op. cit. p. 266) This implies, as Galileo well realized, that space and time are ‘infinitely divisible’ since speed is the ratio of distance to time ― “Thus, we may understand that whenever space is traversed by the moving body with a motion which began from rest and continues uniformly accelerating, it has consumed and made use of infinite degrees of increasing speed….” (Galileo, op. cit. p. 266). What is more, we can (in imagination if not in practice) change a triangle into an equivalent rectangle no matter how tiny the triangle and resulting rectangle are. Distance is speed × time, so we can present distance as the ‘area under the curve’ of a speed/ time graph, plotting speed vertically and time horizontally. Now, in the case under consideration, the speed is ‘always’ changing and so has a different value at every single instant no matter how brief (does anyone really believe this can be the case?). Also, provided the time interval is ‘brief’, we can, without too much exaggeration, treat the speed as constant and equal to the average height of the two uprights (h­2 – h1)/2. The way round the problem was to geometricize it. As we all learned at school the area of a triangle is half the height times the base. But most people don’t know or have forgotten why this works : it is because, taking the simplest case, that of a right angled triangle, you can remove the upper ‘half-triangle’ and bring it round to form a rectangle. And, for us, rectangles are easier to deal with. What is more, we can (in imagination if not in practice) do this no matter how tiny the right angled triangle and resulting rectangle is. Distance is speed × time (sort of), so we can envisage distance as the ‘area under the curve’ of a speed/ time graph, plotting speed vertically and time horizontally. Now, in the case under consideration, the speed is supposed to be ‘always’ changing and so has a different value at every single instant no matter how brief (does anyone really believe this?). But over a fairly short time interval we can, without too much exaggeration, consider it to be constant and equal to the average height of the two uprights (h­2 – h1)/2. We can now measure this narrow rectangle : it is (h­2 – h1)/2 × t(­2 – t1) and, doing this again and again, we can get out a total for the whole area. I shall not give the details of the derivation which can be seen in any book on Mechanics or Calculus (Note 3) because I shall in a moment derive a formula without any appeal to geometry. Suffice it to know that the final result is the well-known equation of motion for the case of constant acceleration from rest, s = ½ gt2 where s is the distance and g, the acceleration due to the gravitational attraction of the Earth, is a constant whose value was obtained, not We can now measure this narrow rectangle : it is (h­2 – h1)/2 × t(­2 – t1) and, doing this again and again, we can get out a total for the whole area. I shall not give the details of the derivation which can be seen in any book on Mechanics or Calculus (Note 5), the final result being, of course, the well-known equation of motion for the case of constant acceleration from rest, s = ½ gt2 where s is the distance and g, the acceleration due to the gravitational attraction of the Earth, is a constant that has to be determined by observation. There can be no doubt that the formula works so it must be true, or very nearly true. But is the normal manner of deriving it acceptable? To me, not, because, as always in calculus, there is the peculiar procedure of first of all stating that some quantity (speed in this case) is ‘always’ changing, but then, a moment later, turning it into a constant while claiming that this does not matter because it is only a constant for such a short period of time ! It is like hearing that so and so is really a very nice guy and if you object that on every occasion you meet him he is despicable, being told that this doesn’t matter because, every time you meet him, it’s only for a ‘very short time’ ! Galileo, of course, did not have the modern concept of a ‘limit’ in the mathematical sense since it was only evolved, and very painfully at that, during the late nineteenth century. But, contrary to what most people assume, the modern mathematical treatment using limits does not so much resolve the conceptual problem as make it technically irrelevant. But there is a cost to pay : the whole discussion has been removed from the domain of physical reality where it originated and where it belongs. Is there any other way of tackling the problem? Yes, I believe there is. We can simply suppose that when we continually reduce the intervals of time, we eventually arrive at an interval of time so small that the particle does not accelerate (or even move) at all ― since there is not enough ‘time’ for it to do so. This is the ‘finitist’ hypothesis which is the kicking-off point for Ultimate Event Theory. However, before passing on to the UET treatment, we ought to see what Newton made of the problem. He is over generous to Galileo when he states right at the beginning of his Principia that “By the first two laws [of motion ] and the first two Corollaries, Galileo discovered that the descent of bodies varied as the square of the time and that the motion of projectiles was in the curve of a parabola” (Newton, Principia, Motte’s translation p. 21). If this really is the case, Galileo did not express himself as clearly and succinctly as Newton and, above all, did not explain why this is so. Galileo does speak of the ‘heaviness of bodies’ but does not quite manage to conceive of gravity in the Newtonian sense. In effect, a falling body is on the receiving end of a repeating force which moves it from one state of uniform velocity (which it would keep for ever if subject to no further outside impulse) to the next. Newton thus, as no one had done before him, derived the observed phenomenon of constant acceleration in a falling body from just two assumptions, his first two Laws of Motion. When deriving an equation, especially a well-known one, one must beware of circular reasoning and assuming what we wish to prove. So, let us lay our hands on the table and declare what basic assumptions we require. First of all, we need to assume that, in cases of free fall, the body ‘keeps on accelerating’, i.e. goes faster and faster as time goes on. This assumption is, in Newton, an Axiom, or an immediate deduction from an Axiom, but it was originally the fruit of observation. For there might conceivably be worlds where falling bodies fall at a constant rate, i.e. , don’t speed up as they fall. However, it seems to be generally true. Secondly, we need to assume that a falling body, while it speed is variable, has a constant or very nearly constant acceleration due to the Earth’s attraction ― this follows from Newton’s Laws of Motion which are presented as ‘Axioms’ though ‘amply supported by experiment’ . If Newton is to be believed, the speed of a falling body changes inversely with the square of the distance, i.e. the nearer you are to the Earth the more rapidly your speed increases (until it reaches a terminal velocity because of air resistance). Also, because the Earth is not a perfect sphere, there will be slight variations according to where you are on the Earth’s surface. However, over the sort of distances we are likely to be concerned with, there will be little, if any, observable variation in the value of g, the constant of acceleration. A third assumption is, however, also necessary. Either we suppose, as Galileo and Newton did (Newton with some hesitation) that ‘time and space’ are ‘infinitely divisible’ or we suppose that they are not and draws the necessary consequences. Ultimate Event Theory presupposes that all events are made up of ‘ultimate events’ (which cannot be further divided) and that there is an ‘ultimate’ interval of time within which no change of position or exchange of energy is possible. When dealing with of the infinitely small ling with a ‘sequence’ of events, there is always a first event and that this event has occurrence on a particular spot at a particular moment. There can be change but not continuous change (of position or anything else you like to mention). The dimensions of the three-dimensional spot where an ultimate event has occurrence are, currently, unknown as also is the extent of the elementary interval of time which I denote a ksana (from the Sanscrit for ‘instant’). All we can say about these fundamental dimensions of Space/Time is that they are ‘very small’ compared to the dimensions we deal with in the observable macroscopic ‘world’. It may seem that there is not much one can do with such a hypothesis, but, surprisingly, there is, since the whole art of Calculus and Calculus-like procedures is to start off with unknown microscopic quantities and eventually dispense with them while, miraculously, ending up with the sort of values we can work with. Fourthly, if our eventual formula is to be of any use, we have to assume that it is possible to determine an ‘initial state’, ‘initial distance’, ‘initial rate of change’ or the like. In this case, we have to assume that we can make at least a reasonable guess at the size of g, the constant of acceleration due to the proximity of the Earth. We have then a ‘particle’ (repeating ultimate event) displacing itself relative to some landmark event-cluster considered to be ‘at rest’, i.e. repeating regularly. Our particle (event-cluster) has received an impulse that has dislodged it from its previous position since, by hypothesis, it is now ‘in motion’. According to Newton’s Laws (Laws of Motion + Law of Universal Attraction) this impulse in a particular direction will not go away but will be repeated indefinitely ‘from moment to moment’ without diminution. Since the effect of an outside force is to accelerate the particle, its speed will increase but will, by the Law of Gravity, increase by a constant amount at each interval of time since the force responsible for the acceleration does not change appreciably over small distances. The resulting increase in distance fallen will be the same as the displacement ‘during’ the first interval since the ‘particle’ starts from rest. In the terms of UET, at the ksanalabelled 0 , the start point, the particle is at zero distance from a particular grid-point ― it is actually at this point ― and at the ksana labelled 1 it is m spaces further to the right (or left) of the original spot (strictly this spot’s repeat). The initial ‘speed’, which is also the constant acceleration per ksana, is m spaces per ksana where m is an integer. At all subsequent ksanas, the ‘particle’ keeps this ‘speed’ and so displaces itself a further m spaces each time in the same direction. If there were no further force involved, it would keep this current speed indefinitely, but since the gravitational ‘pull’ is repeated it moves a further m spaces at each ksana. ksana 1 ← m spaces → . ksana 2 ← m spaces → . ← m spaces →. d(0) = 0; d(1) = m; d(n+1) = d(n) + d(1) n = 1, 2, 3…. This total displacement has taken place in n ksanas where n is a positive integer, for example, 3, 57, 1,456 or 1068. We, however, do not reckon in ksanas, this interval being so brief that our senses do not recognize it, even when our senses are extended and amplified by modern instruments. What we can say, however, is that there are n* ksanas to a second, where n* , an unknown constant, is a very large positive integer. which is very nearly 3(g/2) if n* is large so the ratio is very nearly 3 : 1 Similarly, the increases during subsequent seconds compared to those in the preceding seconds will be approximately 5 : 3; 7 : 5 and so on. Note that it was not necessary to say anything about ‘areas under a curve’, ‘infinitesimally small’ intervals or, for that matter, limits as n* → ∞. The formula (d(t) = (½ gt2 + ½ (gt)/n* is not a limit : it is an exact formula involving two constants, g and n*, one of which is known (at least approximately) and the other is currently not known because so far it has proved to be unobservable. Whether one actually takes a value such as n* into account (on the occasions when it is actually known) depends on the level of precision at which one is working, but this is a matter for the engineer or manufacturer to decide. In other words, the ‘extra’ distance, which we have tended to discount as being negligible, is now equal to the known increment of ½ g . And this means that we can, at least in principle, determine the value of n* from data and spreadsheets — for it will be that value of t which gives an ‘additional’ increment of g/2. Now, n* is probably far too large a number for this to be currently possible even with today’s computers but we do not have to leave it at that. We can work with nanoseconds instead of seconds and the relation will still be true, although we will now be determining n*/109 which is probably still a large number. Of course, at this level of precision we shall have to be much more careful about the values of g ― will probably have to make further observations to determine them ― and perhaps will also have to take into account the effects of General Relativity. However, since the instruments now available are capable of determining the tiny Mössbauer effect, this should not by any means be an impossible task. I confidently guess that within the next twenty years, science will come up with a good estimate of the value of n* (the number of ksanas in a second) and that n* will take its rightful place alongside Avogrado’s Number and G, the universal constant of gravitation, as one of the most important numbers in science (Note 7). The distance, after due substitutions, turns out to be half the previous one, as one might expect, namely 1/4 gt2 + gt/4n* and this must be wrong. This means that gravity must be treated as simultaneously affecting both bodies ‘at once’, i.e. within the same ksana, strange though this seems. Newton himself was worried by the issue since it implied that gravity propagated itself ‘instantaneously’ across the entire universe (Note 9) ! It is, however, probably wrong to conceive of gravity in this way : in General Relativity it is the space between bodies that contracts rather than the separate bodies sending out impulses to each other. In Ultimate Event Theory terms, this makes gravitational phenomena states of the underlying substratum (that I call the Locality) rather than interactions between event-clusters ‘on’ the Locality. This issue will be gone into in more depth when I come to discussing the implications of Relativity for Ultimate Event Theory. Drake, Notes p. 561 op. cit. Note 3 Galileo discusses this possibility but rejects it as unlikely. Note 4 Speed is not a basic SI unit, being simply the ratio of distance to time (metres to seconds). Curiously though, while speed is not something of which we have direct experience, the same is not true of momentum mv, speed × mass. All collisions involve forcible and abrupt change of momentum that we certainly do experience since such changes are often catastrophic (car crashes, tsunamis). I believe, there are systems of measurement which take momentum mv (kg ms–1) or force mdv/dt = ma (kg m s–2) as a primary unit. Note 5 In the more sophisticated modern derivation of the formula, we ‘squeeze’ the area between two limits, one an overestimate and the other an underestimate, and we chop up the interval into rectangles of variable width. But the basic strategy is the same as that of Galileo and Oresme before him. Note 6 Newton presumably meant, ‘generates equal supplementary velocities’, since, as we have had it drummed into our heads in school, force produces accelerations, not velocities as such. It is amusing to see one of the greatest minds in the history of science making a slip that would have earned him a reprimand in a modern school. This is actually not the only place in the Principia where Newton confuses velocity and acceleration; maybe part of the problem was that there did not exist a suitable Latin term (he wrote the Principia in Latin). Note 7 Modern textbooks generally state that gravitational attraction travels at the speed of light. Note 8 Unfortunately, the chances are that I shall not live to see this. What is more, we can (in imagination if not in practice) do this no matter how tiny the right angled triangle and resulting rectangle is. Distance is speed × time (sort of), so we can envisage distance as the ‘area under the curve’ of a speed/ time graph, plotting speed vertically and time horizontally. Now, in the case under consideration, the speed is supposed to be ‘always’ changing and so has a different value at every single instant no matter how brief (does anyone really believe this?). But over a fairly short time interval we can, without too much exaggeration, consider it to be constant and equal to the average height of the two uprights (h­2 – h1)/2. We can now measure this narrow rectangle : it is (h­2 – h1)/2 × t(­2 – t1) and, doing this again and again, we can get out a total for the whole area. I shall not give the details of the derivation which can be seen in any book on Mechanics or Calculus (Note 3) because I shall in a moment derive a formula without any appeal to geometry. Suffice it to know that the final result is the well-known equation of motion for the case of constant acceleration from rest, s = ½ gt2 where s is the distance and g, the acceleration due to the gravitational attraction of the Earth, is a constant whose value was obtained, not from first principles, but from meticulous experiment and observation. There can be no doubt that the formula works so it must be true, or very nearly true. But is the normal manner of deriving it entirely acceptable? To me, not, because there is first of all a lingering doubt in my mind as to whether it is legitimate to represent distances, which are real things, by ‘areas under a speed/time curve’ since this involves plotting velocities which themselves depend on distances and have no reality of their own. But a more serious objection is that, as always in traditional calculus, there is the peculiar procedure of first of all stating that some quantity (speed in this case) is ‘always’ changing, but a moment later turning it into a constant and pretending that this does not matter because it is only a constant for such a short period of time ! It is like saying someone is really a very nice guy but on every occasion you meet him, he will be basty but this doesn’t matter because you only ever see him for a very short time! The mathematical ‘passage to a limit’ does not so much resolve the conceptual problem as make it irrelevant but only at the price of removing the whole discussion from the domain of physical reality where it originated and where it belongs. And in cases where we know that there really is a cut off point (a smallest possible value for the independent variable), this sort of manipulation can, and sometimes does, give incorrect answers which is why, increasingly, problems are dealt with by slogging them out numerically with computers rather than trusting blindly to analytical formula. The dreadful truth that ought ot be inscribed in letters of darkest black in every calculus textbook us that the famous mathematical limit is, in almost all cases, never attained and those of us who live in the real world need to beware of this since the cut off point may be much closer than the mathematics makes it look as if it is. Generally, engineers simply evaluate some quantity to the level of precision they require and don’t bother about the limiting value. But is there any other way of tackling the problem? Yes, I believe there is, deriving the equation of motion directly from Newton’s Laws while adding in the ‘finitist’ assumption on which most of Ultimate Event Theory is based (Note 4). That is, one can simply suppose (what common sense tells us must be the case) that when we continually reduce the intervals of time, we eventually arrive at an interval of time so small that the particle does not accelerate (or even move) at all ― since there is not enough ‘time’ for it to do so. Suppose we have observed that a particle (event-cluster) falling from rest has, or at any rate appears to have, a constant acceleration of g metres/second which takes 1 second to take effect. So, in ‘thing-speak’, if the particle starts from rest, it has moved g metres by the end of the first second. In Ultimate Event Theory there is always a first event, whether observed or not, and, in general, a first cause of ‘motion’. Since the ‘particle’ is in motion, we conclude that, in accordance with Newton’s First Law (or its UET equivalent), the particle has received an impulse that has dislodged it from its previous position and that in the first ksana we are concerned with the ‘particle’ has been displaced by a certain number of spaces (grid-positions on the Locality) in some given direction. We do not know, and do not need to know, what this initial number of spaces is but we can call it g/n metres since there are, by hypothesis, n ksanas to a second. (The quotient g/n is understood to be taken to the nearest whole number.) This is the ‘current velocity’, the equivalent of ‘instantaneous velocity’, namely the ‘velocity’ that the ‘particle’ would continue to have from now on if it were not interfered with by any outside forces. In other words, were this rate of displacement to remain unchanged, ksana by ksana, the particle would traverse n(g/n) = g spaces in n ksanas, which we take to be the equivalent of a second. As for n, all we really need to know at this stage is that this number ‘exists’, i.e. represents a real amount of spaces, and that it is a very large number. The particle (event-cluster) does not, however, as it hap[pens in this case maintain its current ‘velocity’ (rate of appearance) because of the influence of a massive event-cluster near by. Since gravitation is a permanent force, the particle in question will keep on receiving the same impulse ksana after ksana so its overall rate of displacement will increase at each stage but by a fixed amount (g/n) from one ksana to the next (Note 5) . 4 4g/n (1 + 2 + 3 + 4) = 10 g/n …………………………………………….. This distance has been accomplished in m ksanas. There is thus a steady increase of 2d1 = 2 g/n in this case at each ksana and this is why the odd numbers appear at successive intervals of time. The curve formed by joining the dots is what we know of as a parabola because the odd numbers 1 + 3 + 5 + …. (2n – 1) add to n2 and y = x2 is the equation of a parabola. There is, however, a problem with the above. According to Newton’s Third Law every action calls forth an equivalent, oppositely directed, reaction, and this means there is a fixed order of events since action and reaction are not strictly simultaneous (see post on Newton’s Third Law). This is certainly the case for cases of contact but I had thought of making an exception for gravity as Newton himself seems to have done since he is on record as saying that it propagates instantaneously, though he had some difficulties believing this (Note 5). If we consider that, in the case of free fall under gravity, there should still be a succession of events, the ‘action’ will only take effect at every other ksana. I had thought of making it a general principle that an ultimate event always occupies the same position for at least two consecutive ksanas, otherwise it cannot be said to have any proper velocity. I thus had the particle (event-cluster) keep the same rate of displacement for two ksanas before being once more accelerated. This worried me at first since the result seemed completely different to ½ gt2 which must be more or less correct. However, all was well after all : the final result merely differed in the second term. This time, for reasons that will become apparent, I set 1 second as equal to 2n ksanas (and not n) so the initial displacement is g/2n metres. Note 1 For the man who is hailed as the inventor of the experimental method, Galileo is surprisingly cavalier about the details. He actually gives a figure at one point : “an iron ball of one hundred pounds…falls from a height of one hundred yards in five seconds” (Galileo, Dialogue p. 259) which is so widely off that one of his own pupils queries it. Note 2 To his credit, Galileo does consider the possibility that the speed of a falling body fluctuates erratically rather than increases uniformly though he discounts this as unlikely : “It seems much more reasonable for it [the falling body] to pass first through those degrees nearest to that from which it set out, and from this to those farther on” (Galileo, op. cit. p. 22). Notew 4 This is most likely the reason why Newton continued to use the cumbersome apparatus of geometric ratios in his Principia instead of his ‘Method of Fluxions’ which he had already invented. Sticking to ratios and geometry sidesteps the problem of infinite divisibility and the reality of ‘indivisibles’ concerning which Newton had serious doubts. . Note 2 “In the Methodus Fluxionum Newton stated clearly the fundamental problem of the calculus: the relation of quantities being given, to find the relation of the fluxions to these, and conversely.” Boyer, The History of the Calculus p. 194. Note 3 y ‘fluxion’ Newton meant what we call the ‘rate of change’ or derivative. Note 3 In the more sophisticated derivation of the formnula, we ‘squeeze’ the area between two limits, one an overestimate anbd the other an underestimate, and, moreover, we chop up the interval into rectangles of variable width, not just the same. But the basic strategy is the same as that of Galileo and Oresmebefore him. In the ‘infinitist’ treatment of Calculus, we always have to calculate velocities when what we are interested in is distances. 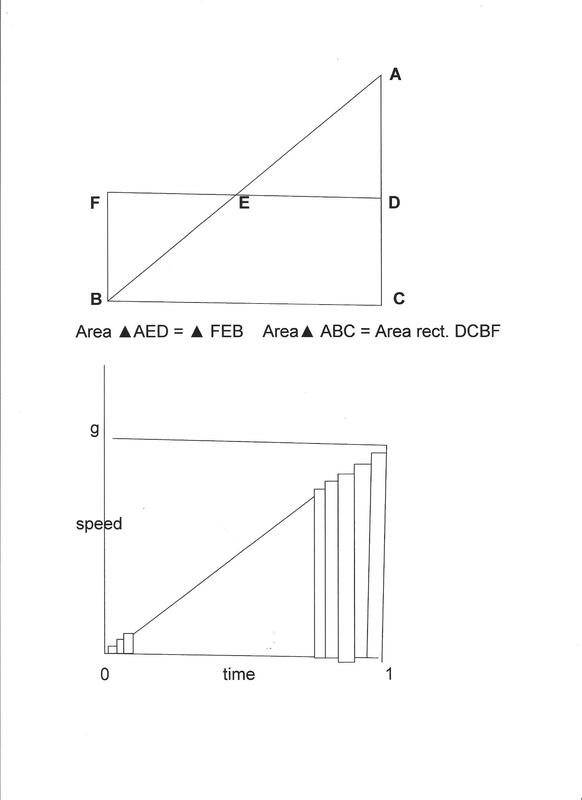 In UET, at any rate in this case, we can deal directly with distances which is as it should be since velocity is a secondary quality whereas distance (relative position) is not. This is rather obscure and even wrong to modern ears. For Newton speaks of “equal forces…generating equal velocities” when every schoolchild today has had it drummed into them that force produces acceleration rather than velocity as such. However, Newton does not seem to have had a suitable (Latin) word for ‘acceleration’ and we must, I think, understand that he meant “equal forces generate equal supplementary velocities” while assuming, in accordance with the First Law, that a body retains the velocity it already has). Note, however, that Newton, like Galileo, does not give us an equation of motion but still talks the geometrical language of proportion ― and this is typical of the way the entire Principia is written, even though Newton had already invented his version of the Calculus, the Method of Fluxions. Note 5 Modern textbooks generally state that gravitational attraction travels at the speed of light but there is some doubt as to whether one can really talk about gravity travelling anywhere since it is the intervening space that contracts according to General Relativity.